After YEARS of failed attempts to recreate and fruitless internet searches I finally found the original Benihana’s Ginger Salad Dressing recipe!! Benihana’s has several of their recipes posted to their website, but here’s the thing. They aren’t the real recipes. How do I know? I’ve tried them as have many family members. Plus – the recipes they had on their site years ago aren’t even close to the recipes they have posted online now. Why do they do this? I have no idea. Just leave them off your website if you don’t want to share with the world. I like to to make this Avocado Cucumber Salad to pair with this Benihana’s Ginger Salad Dressing. I’ve never been called a selfish person (but I can pout with the best of them! 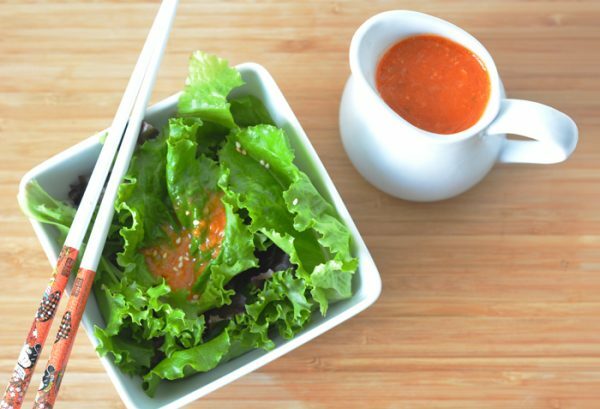 ), so I’m going to share this Copycat Benihana’s Ginger Salad Dressing with you. You’re welcome. TIP- There are a few edits to make this 21 Day Fix approved: Use olive oil in place of the peanut oil but throw in about 4-5 whole peanuts to keep the flavor. Replace the Soy Sauce with Braggs Liquid Aminos and the sugar with honey, Stevia or date sugar. Add all of the ingredients to a blender or food processor and blend until almost smooth. May be kept refrigerated up to one week.